While most NATO partners are cutting defense budgets because of the economic crisis and their activities in Iraq and Afghanistan, the arms build up in Latin America is getting stronger. Venezuela and Colombia are the countries that are investing most in new arms lately. Venezuelan President Hugo Chávez’ weapon purchases in recent years that are totaling more than $15 billion already, is creating unrest in Latin America. While President Chávez says that Venezuela has the right to modernize its army, which is of course very true, he also said he wishes to spend $30 billion to modernize the country’s armed forces. But there is something odd going on here. Let's take a look at the financing first. Only few of all the weapon purchases were accounted for in the consecutive National budgets. The funds Chávez is using for the purchases of these new weapons, are mostly coming from loans or credit lines from the exporting countries. How and when these loans are being repaid is often not unveiled, but it makes sense to assume that these loans will be repaid by future oil deliveries of PDVSA. However other deals could be conceivable as well. For instance in the case of Iranian weapon deliveries, Venezuela could pay with Uranium ore. Bottom line is that these weapon purchases are kept out of the National budget and/or defense budget. Banco Central de Venezuela isn't specifying all external debts and also not in detail. PDVSA isn't mentioning delivery obligations to Russia in its annual reports. Venezuela paid off $3 billion in loans owed to the International Monetary Fund and the World Bank in 2007, ending ties to two multilateral lenders. Therefore Venezuela isn't allowing public audits of its balance by IMF and Worldbank anymore. Venezuela is still a member of IMF, but it is refusing IMF's Article IV consultation since 2004. So it is nearly impossible to get all the right figures. Besides these indistinct weapons debts, Venezuela official debt service has grown up to 12.2 percent of Venezuela's National budget in 2010 and will be 13.75 at the end of this year (US service debt is 6% of National budget). Venezuela's officially domestic and external debt, that is weapon loans and debts of state-companies excluded, has grown very fast since 2009. Because of higher oil prices external debt will gradually decline as a percentage of GDP, and is expected to be around 24-25% of GDP this year. It looks like the purchases are made in a rather improvised fashion, following a mysterious process without bidding, prior studies, testing or discussions. Chávez seems to make the decisions practically on his own and is acquiring preferably Russian and Chinese technology lately, that could be difficult to adopt by segments of the National Armed Forces. After Chávez first came to power, the U.S. stopped providing Venezuela with spare parts for its U.S.-manufactured defense weaponry. I don't want to discuss here the 92 mid-size T-72B1V tanks, the 240 bulletproof infantry vehicles (BMP-3 and 8x8 BTR-80), 9 submarines, nearly 50 vessels of different sizes, dozens of Sukhoi Su-30MK2 fighting airplanes, an undetermined number of Chinese J-10 fighter airplanes, over 40 Mi-17 Hip transport helicopters, 10 Mi-35 Hind-E gunships, 3 Mi-26T Halo heavy transport helicopters, 200 laser guided bombs types KAB-500 and KAB-1500, 50 Kh-29 air-to-surface missiles, 50 Kh-31A1 anti-ship missiles, 50 Kh-59ME TV-guided cruise missiles, 100 Vympel R-27 medium-range air-to-air missiles, 150 Vympel R-73 short-range air-to-air missiles, 12 TOR-M1 air defense systems and at least 67 Russian SA-24 Igla shoulder-fired missiles. A powder plant that's being build with the help of the Iranians in combination with two plants that are build with the help of Russian Izhevsk Mechanical Plant (IMP). One plant will manufacture 50.000 AK-103 assault rifles per year and another plant will produce 7.62-mm ammunition for the rifle. The IMP plants are being build at CAVIM in Maracay, Aragua province. The project started in 2007 and should have been finished at the end of 2009 but was delayed several times, because of lack of payments by Venezuela. Also several arsenal explosions and fires this year in the Maracay complex could have caused delay. The latest news is that the first test batch of AK-103's was manufactured in May 2011 and that the plant would be in full operation at the end of 2011. The big unanswered question here is, where will the manufactured assault rifles go to? Not to the Venezuelan Army or Police, because they are already equipped with brand new AK-103's. The Colombian FARC-EP has been mentioned, but that's only max. 10,000 guerrillas, besides Venezuela signed and ratified the "Inter-American Convention Against the Illicit Manufacturing of and Trafficking in Firearms" treaty in 1997 (US only signed, but did not ratify), so that's unlikely. My guess is that some of the manufactured AK-103's and ammunition will be sold to countries that support the Bolivarian revolution, but that most of them will be stored in warehouses to be used in the case of a war by the National reservists. Chávez decided in February 2006 to increase the reservists from 500,000 to 2,000,000. Maybe occasionally AK-103 shipments will go to resistance organizations, like the Honduras uprise in 2009. The purchase of five advanced S-300VM "Antey-2500" air defense missile battalions for $800 million. These weapon systems are the same five that Russia refused to supply to Iran because of sanctions imposed by the Security Council of the UN. Iran filed a lawsuit with the International Court of Arbitration in the beginning of 2011 to prove the deliveries of S-300, which is considered a defensive system, were not subject to an arms sales ban under UN Resolution 1929. Iran needs the S-300s to protect its nuclear installations from Israeli attacks. Israel immediately turned to Washington to try and block the Venezuelan transaction. Clearly, these Venezuelan S-300s are bound for their original client, Iran, through its good friend Chavez. However, Russia does not permit Venezuela to deliver S-300 missiles to Iran said the Russian ambassador to Venezuela Vladimir Zaemskiy September 5th, while he didn't mention any sanctions if Venezuela would sell them to Iran. The S-300 are considered more powerful (200 km range) than the equally anti-aircraft systems Tor M-1 (12 km range) that both Venezuela and Iran bought some years ago. Russia completed the delivery of 29 TOR-M1 anti-aircraft missile systems to Iran in late January under a $700 million contract signed at the end of 2005. Iran tested its Tor-M1 in 2007. The Tor missile system (introduced in 2005) is an all-weather low to medium altitude, short-range surface-to-air missile system designed for engaging airplanes, helicopters, cruise missiles, precision guided munitions, unmanned aerial vehicles and ballistic targets. The long-range S-300VM "Antey-2500" is designed to protect large military targets like military airbases or harbors against massive multiple air attacks, that is max. 24 simultaneously incoming missiles or other air threats. TOR-M1 is offering already sufficient protection against cruise missiles, aircrafts, helicopters and so on, but can engage only one air threat at the time. One could ask oneself if Venezuela really needs to protect itself with S-300 systems and if the existing TOR-M1 systems are not suited for the job already. 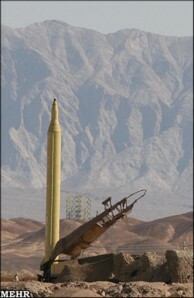 The purchase of Iranian missiles and building of a missile base. The German magazine Die Welt published in November 2010 an article that stated that Iran is helping Venezuela to build a military missile base on the Paraguaná peninsula (the northernmost tip of Venezuela), starting at the end of 2011. The missile base is supposed to be a joined venture between Iran and Venezuela and will be manned by Venezuelan as well as Iranian officers. Iran granted Venezuela permission to use the missiles in case of an "emergency and for "national needs". Iranian Shahab 3 (range 1300-1500 km), Scud-B (285-330 km) and Scud-C (300, 500 and 700 km) missiles will be deployed in the proposed base. The Die Welt article has been referenced by many media sources, while no new facts are being reported since then. The report was denied by the US and Venezuelan government. The situation that could be unfolding in Venezuela has some resemblance to the Cuba crisis of 1962. We clearly see that Venezuela is modernizing its armed forces rapidly and financing the weapon purchases with huge loans which Venezuela's economy can't afford. Venezuela is even seeking and finding allies to defend itself. It's clear that Hugo Chávez feels threatened by the US. He thinks the US might overthrow his regime, invade Venezuela and/or stop the deployment of his Bolivarian revolution. His fears are not completely unfounded. The US had knowledge and was probably involved in the 2002 Venezuela coup and the ousting of Chávez. The Iraq war is a clear example to Chávez of what the US can do if US oil supply is threatened. Another threat are the 7 military US bases in Colombia that are officially being used for "full spectrum operations throughout South America” against threats not only from drug trade and guerrilla movements, but also from “anti-U.S. governments” in the region. 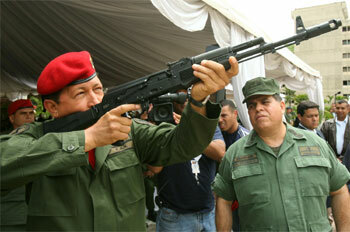 The recent arms buildup of the Colombian army with the help of US monies is alarming to Chávez too. The US did also support the Honduras 2009 coup by not supporting Zelaya, while Chávez and Zelaya had other plans for Honduras. The 2010 Ecuador coup attempt was suspected to have CIA involvement. And of course 19th and 20th century history counts many US interventions in Latin America. The US isn't selling weapons to Venezuela for some years now and is trying to block every Venezuelan weapon deal it can. If US parts are present in some European weapon system, the US will object. Venezuela currently supplies 10 percent of oil imported by the United States. The US is already trying to decrease Venezuelan oil imports and to replace them by Canadian oil. It's unlikely the US will intervene in Venezuelan affairs because of oil imports. However, it's not unthinkable the US might get involved in some coup attempt to stop the Bolivarian revolution in the near future.